The Canyon Ridge Twin Bedroom Group by New Classic at A1 Furniture & Mattress in the Madison, WI area. Product availability may vary. Contact us for the most current availability on this product. 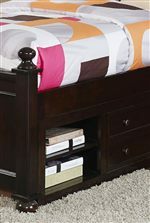 Transitional in style this youth bedroom collection will grow along with your child. The simple style with a dark brown finish make this collection perfect for either a boy or girls' room. 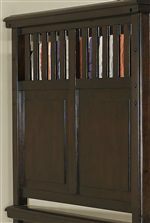 Rounded bun feet and matching pilasters are paired with framed panels to tie traditional elements in with casual silhouettes. 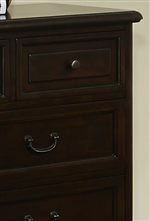 Finishing the elegant designs are dark, antique looking metal knobs and pulls. The Canyon Ridge collection is a great option if you are looking for Transitional furniture in the Madison, WI area. Browse other items in the Canyon Ridge collection from A1 Furniture & Mattress in the Madison, WI area.